... I just picked me a grapefruit! My dreams at night are always all over the place and usually not worth remembering, let alone sorting out. However there is an image from last night's dreams that I love remembering. What I dreamed was, Howard and a bunch of our friends and I were walking among all these grapefruit trees. There were all these big beautiful yellow grapefruits on them, just hanging there, ripe for the picking. So I picked one of these grapefruits. I began peeling it because that is how I love to eat grapefruits, as opposed to cutting them in half and digging out the sections. And the grapefruit was a deep crimson inside. 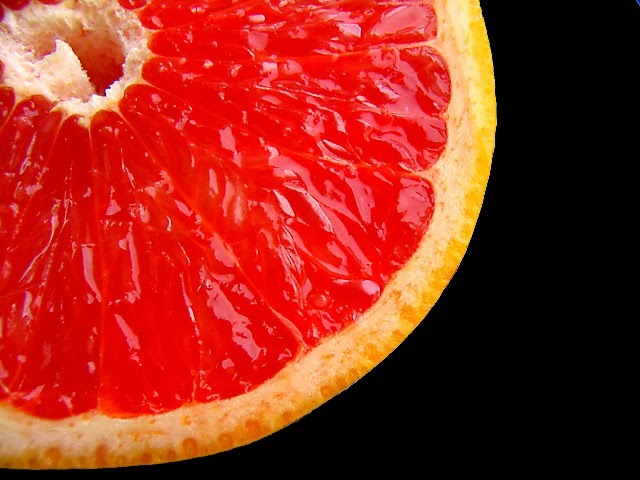 Such a gorgeous pink grapefruit! And it was so sweet. I said, "Wow, this is the most delicious grapefruit I have ever had! And it was just right here waiting for me!" To see or eat a grapefruit in your dream represents a sense of well-being and a refreshed state of mind. Your are experiencing an uplift in your spirits and rejuvenation of your body. To see a grapefruit tree in your dream, is symbolic of your talents, belief system and good deeds. It may also represent the fruits of your labor. I loved this! What is funny is, this last week I have been working on my health. I just thought if I ate better and slept better and lessened the chaos of my life I might be in better shape to get work done on the Pennario project. Which I have. So that could be the reason for the grapefruit in my dream. Then again it could simply be that I was eyeing up grapefruit yesterday at Albrecht Discount. They are 59 cents and I decided that was too much. Maybe I just had to have one!